Oconnor Towers is a beautiful 4 bedrooms (two master king en-suites), 3-bathroom home situated in the quiet friendly neighborhood of Indian Creek, which is an outstanding development within 3 miles of Disney properties. It is in easy reach of all other major attractions. Oconnor Towers is the perfect home away from home. It has a fully equipped kitchen with an adjoining formal dining room and a games room. The spacious living room is tastefully furnished with a queen sized sleeper sofa bed and includes a HD 1080 60 inch television. The large glass sliding door leads into the covered lanai to the fully enclosed 30 foot SOUTH facing pool (one of the largest in the area) plus an 7 foot lounger spa. With the flick of a switch, turn on those jets bubbles and for the next hour enjoy the real soothing benefits of having every muscle in your body massaged. Love the extended pool deck along with the conservation behind the house. No rear neighbors. Work on that deep tan. The south facing pool and spa means visitors will experience maximum Florida sunshine by day and a peacefully tranquil sunset before night. The screened terrace on the extended deck provides an expansive view of the lush, wooded conservation area surrounds spa. No homes are behind the house, ensuring your privacy. Additional outdoor amenities include safety alarms on doors that lead to the pool. 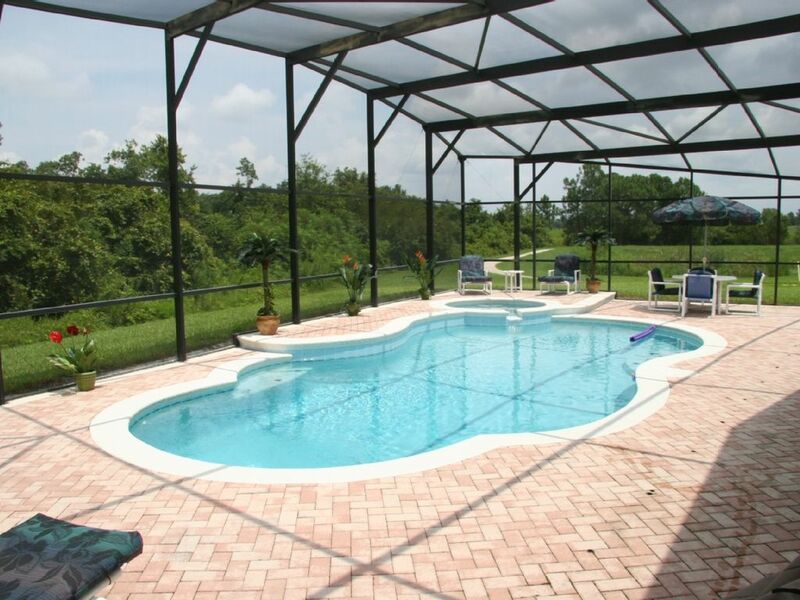 This home comes equipped with the latest in child safety fencing for the pool deck. If you are traveling with young children, you can easily install these portable fences in minutes. The house was in great shape, very clean and spacious. I traveled with 2 kids and my wide and we all were very comfortable. The kitchen as all utensils, pots,pans, toaster, coffee maker, can opener, everything you would need to cook meals. spacious living room with large TV, PS3 and wii (no games) dvd player with family movies, great surround system (I was able to hook up via Bluetooth to my phone, but was unable to sync with TV). The temperature is set and can only be manipulated 3 degrees. The AC is on 75, which was a little stuffy at times. Bedrooms were great, probably the most comfortable mattress I have ever slept on, to the point I am looking to buy one. One room was a Frozen theme and my daughter loved it. Master bedroom is big with huge tub. Pool area is very nice, with a large pool everyone loved. The hot tub was nice however was the same temp or cooler than the pool which made it more like a cool pool with jets. Game room/garage was nice. It has a pool table, air hockey, foosball, washer and dryer and card table. No AC in there though and its very warm. Property and location is nice. There is a camera on the front and back door as well as motion lighting and full alarm system, which make you fell good. The area is nice peaceful and quiet. The parks and most attractions were all 15 or 20 minutes away, groceries and gas stations 5 minutes away, and easy to get in and out of. Thanks we had a great vacation. We really enjoyed our stay in this property! Very comfortable home and convenient to anything we would want to do. My children especially enjoyed the pool and hot tub. We quickly felt at home!!! The house had everything and more than we needed to have a great family vacation!! Very close to attractions but we could of stayed at home and enjoyed! The pool and game room were better than advertised!!!! Our Granddaughter just loved her room!!! We plan on being repeat customers!! Thank You so much for an awesome vacation!! The location of the house was great for our Disney vacation. The house was clean and comfortable. Oconnor Towers is off Highway 192, five minutes west of Interstate 4. The neighborhood has a variety of playgrounds for vacationing visitors to enjoy, putting green and a play area with a slide for the children. Numerous restaurants and stores like the Outback Steak House, Red Lobster, McDonalds, Subway, Winn-Dixie Food Store, Walgreen’s Drug Store and many more, are all located within a mile or two, on highway 192 and Formosa Gardens Blvd. The entrance to Walt Disney World is five minutes away. So close, that the firework display from Epcot can be seen from the pool. Market Street at Celebration, Old Town Shopping, Downtown Disney’s Pleasure Island, Downtown Disney’s West Side, Universal City Walk, are all within twenty minutes of Indian Creek. Golfers will fall in love with this estate, as the Mystic Palms Golf and Country Club are only moments away.